Tina is an 8 year old Morgan-Friesian mare who presented for a suspected right forelimb lameness. She has no history of lameness.The only previous healthy issues are an allergic dermatitis episode, where she then got her head stuck in a panel trying to itch herself a few months prior. No lameness occurred after that, but she did have some body work done after this episode – myofascial release on her neck and shoulders. She is used for dressage. Neck vertebral injury, laminitis, other causes of forelimb lameness such as sweeny. GV 14 – central point that has neuro communications with muscles in the thoracic limb. I Also wanted to start with this point to judge Tinas’s acceptance of needless, and this point has a strong autonomic component that may calm her and make her more amenable to further needling. LI 16 and LI 17 -Fore forelimb lameness and pain. Also good for caudal cervical muscle tightness. I did LI 17 on both sides. Bl 11-12 – over Scapulae to try and access neuromodulation near the brachial plexus. LI 11 (probably placed closer to LI 10) – for forelimb lameness and pain as well as for autonomic stimulation. She was sensitive to this needle. It stayed in for about 3 minutes before she repeated tried to flick it out with her mouth. Third Session 4 days later -Did not appreciate lameness when walking on the gravel as I did on the first day. Began with GV 14 again. During exam, I did not elicit soreness in LI 18 region. This was needled still and was accepted well. Muscle tension in her caudal neck also seemed to be decreased bilaterally, though still present. Fewer taut bands were felt in her neck region. E-stim from LI 17 → GB 21 this time bilaterally to continue to release any tension in her caudal neck region. Li 11 repeated on right side. 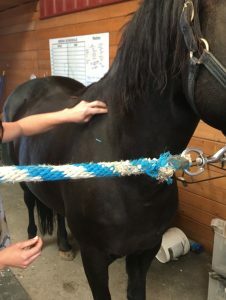 Acupuncture can be a great tool for pain in horses, especially for clients who have given their horses chronic phenylbutazone or banamine treatments. Xie et al found that three sessions of electroacupuncture had better results of relieving pain, than did using phenylbutazone. Bute can be an overused medication, and though reasonably safe, may not be the best option in some of our patients. This was my first acupuncture session on an equine patient (and only so far), as they are not a large part of my practice. 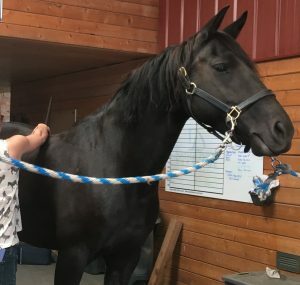 It was a learning experience for me on how quickly horses can decide they are done with treatment. I think for me, working with the other veterinarian in the practice who sees horses regularly to try and encourage him to recommend acupuncture, as well as putting myself out there more for equine acupuncture, will make me more successful in treating equine patients. Xie, H, et al. “Evaluation of Electroacupuncture Treatment of Horses with Signs of Chronic Thoracolumbar Pain.” Journal of the American Veterinary Medical Association., U.S. National Library of Medicine, 15 July 2005, www.ncbi.nlm.nih.gov/pubmed/16047667.